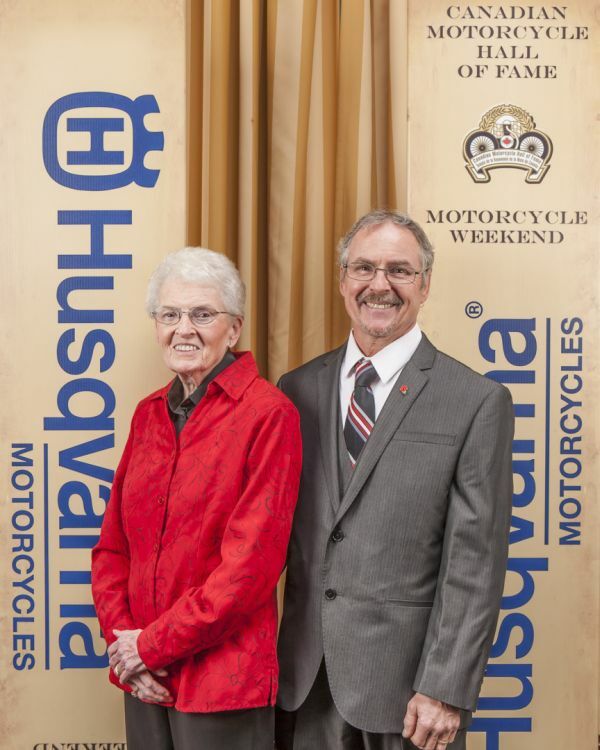 Muriel Kelly (Blackborow) born in 1934 and raised in the west end of Hamilton, Ontario came to love motorcycles kind of by osmosis. Her Dad owned a large bike complete with rigid forks and an oil or gasoline powered headlamp, which he rode all over the unlit, unpaved roads of Southern Ontario in the midst of the Depression looking for work of any kind. One day two friends (and daughter) of her Dad’s dropped by on their bikes and she ended up riding with one of them. This friendship and the bikes put her in touch with a few young guys and girls who hung around a small bicycle shop in Westdale, using the basement as a makeshift motorcycle club. Most of the guys rode 98cc James or 125cc Francis-Barnetts and were turned away from joining the powerful Black Hawks Motorcycle Club. They decided to form their own motorcycle club in 1947, calling themselves The Flying Midgets and Muriel was elected Secretary by default being the only one who owned and could use a typewriter. Muriel first met Jim in a hospital room while she was visiting a friend; she was introduced but never saw him again until he joined the Flying Midgets in 1950. Their friendship flourished leading to marriage in September 1952. In 1955, son Mike was born, followed by daughters Kerry in 1958 and Shannon in 1961. The club’s interest were gradually shifting to the competition side of motorcycling and Jim purchased a Triumph Trophy that was light enough and low enough that she could ride it. As the bikes got larger and more powerful, the Flying Midgets name seemed incongruous and in 1955 a name change was proposed – after a heated debate, Hamilton’s Steel City Riders, was the choice. Club racing was getting more organized and as club secretary, Muriel fell into the role of sign-in person, lap scorer, results compiler, and membership secretary – jobs she held in one capacity or another until her retirement in 2011. In 1983, the opportunity came to visit friends in England and attend the ISDT in Builth Wells, Wales. Canada did well in spite of the adverse conditions and the highlight was seeing Larry Bastedo walk into the hotel during our celebration party, carrying the Watling Trophy. Canada was awarded the trophy for the Most Improved Country in the event. Muriel was hooked and that began thirty wonderful years at the ISDT (E) each one different unto itself. Jim and Muriel attended the next fourteen ISDE’s together as Coordinator, Manager and sometimes Jury Delegate and at the 1997 event in Brescia, Italy, they previewed the 1998 event to be held in Cessnock, NSW. Asked if they were going, they replied, “God willing and the sky don’t fall.” But it did and Jim’s beloved ISDE’s ended for him less than two weeks after returning home. In early 1998, thirteen people had expressed interest in going to the ISDE in Australia and Muriel felt Jim would haunt her if she didn’t make an attempt to help them get there. Enlisting the help of Dave and Hazel Armstrong, the CMA and son, Mike for support, they set about to make it happen. After nearly 11 months of preparation, letters, faxes, phone calls and vast amounts of frustration, they boarded the plane in Toronto with only 3 of the original 13 riders who had expressed interest. Jim really wanted to go to Australia so Muriel had his picture put on a tshirt to wear in the Opening Ceremony Parade of Nations and he was there in spirit. All 3 riders won silver medals. The ISDE continued to flourish, number of riders and support people waxed and waned but the core of support has remained constant; Bettie De Vries and Jan Van Dijk, the invaluable Dutch connection for 30 years, Muriel and son, Mike, Dave and Hazel Armstrong and Lee Fryberger. Muriel retired after the ISDE in Olbia in 2013 but she is confident that the new regime and the Canadian ISDE Gold Fund will continue to support Canadian riders. Those that work so hard behind the scenes are seldom noticed or recognized and we are pleased to welcome “Butch” Kelly as an inductee in the Hall of Fame.